The above story about Bresail Bodivo is from Martin Haverty’s The History of Ireland, Ancient and Modern (1867). It quotes from the Annals of Clonmacnoise a story which is familiar from the Metrical Dindshenchas – a story that appears to describe the reason the Dowth passage-mound in the Boyne Valley was built. Here is the Dindshenchas version. 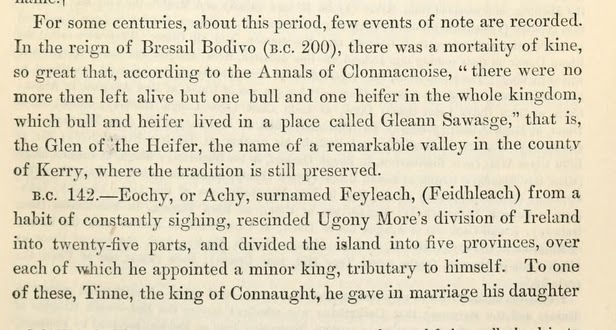 The above version from the Annals of Clonmacnoise names the valley where the bull and heifer lived – Gleann Sawasge.